Legend has it that slightly later than the Chinese, the Japanese started playing a football game called Kemari. Official records show the game of Kemari may have started a few hundred years later but it is highly likely that some type of game existed earlier. 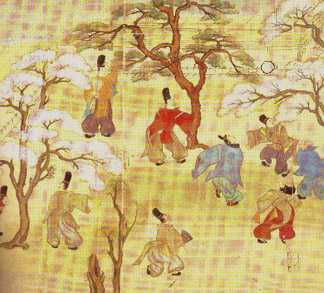 In fact a recently discovered text states that there was a game between Chinese Tsu Chu players and Japanese Kemari players in approximately 50 CE. Obviously this changes the date of origin dramatically and if true, it is also the first recognised international match!!!!! The game of Kemari was, and is, for all intense purposes a game of keepy-uppy. 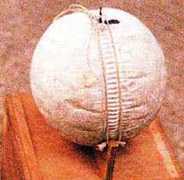 It involved a ball, which was made of deerskin and stuffed with sawdust. The ball was about 8 inches in diameter and was kicked between players. There could be a varying number of players (anywhere from 2 to 12 players) and the game was not competitive but ‘..a more dignified and ceremonious experience..’ requiring great levels of skill. There was no tackling or vying for the ball as in football nowadays; the ball was simply passed from player to player in the air. The ball was only touched with the feet and when a player got the ball he was allowed to kick the ball in the air as many times as he liked in order to control the ball. Then he would pass the ball to another player. When a player received the ball and was controlling it, he would shout “ariyaaa” everytime he touched the ball. When the ball was finally kicked to another player the last shout would be “ari!”. Hence, you would hear a player shout “ariyaa, ariyaa, ariyaa, ari!” until he got the ball back. Kemari was played on a pitch (called a kikutsubo) marked out by trees. The aristocrats would grow trees in specific areas in their gardens so as to have a permanent pitch. Others grew trees in pots so that they could mark out the pitch dependent on the number of people playing. The four trees used to mark out the pitch were normally a cherry tree, a maple, a willow and a pine. Many hundreds of years later Japanese players styled an outfit to wear when playing Kemari and the game was incredibly popular between the 10th and 16th centuries. Some researchers believe that Marco Polo (1254 – 1324) found Kemari and brought it back to Europe as a forerunner to football. However football was already in Europe at that time so I am afraid we cannot give Marco Polo any credit for the discovery of football.